Basement moisture is common in many homes. A little dampness is expected because the basement remains cooler than the rest of the house. And because it’s an under-utilized space, a lot of homeowners don’t realize they need basement moisture control until there’s a serious problem, like mold and mildew being transported through the house’s ductwork and causing health issues for the children and the elderly. This is why it’s very important to get an expert inspection of the space for potential issues before considering any type of renovation or upgrades. One way that you can help resolve basement moisture problems is having a basic understanding of what could be going wrong. Basement moisture is caused by either direct leak of water into your basement or difference in temperature between your basement and the rest of the house. Let us talk about easy stuff first. In the summer, temperatures in your basement are always several degrees lower than the rest of your house because soil around it protects it from overheating. Condensation occurs when warm moist air strikes a cold, dry surface, such as a basement wall or window. Moisture condenses in your basement, and with time causes rust and mold problem. The biggest condensation can be seen on your water pipes. Keep your furniture away from the basement walls to ensure no difference of temperature exist between surfaces that would cuase moisture condensation and mold growth. High water table. At some places, underground water in the soil is naturally standing higher than your basement floor. If your basement is not protected, it leaks inside. Do you have a sump pump? Make sure it works properly. The water from a faulty sump pump is a different issue than water coming in from the ground or moisture created by clothes dryer. Driveway grade. Is your house graded properly? If yourhous is on the slope and asphalt around it doesn't have a slight slope away from the house, you will have issues with basement moisture. Sealing of external cracks. Is your house foundation properly sealed? In worse case scenarios the basement’s construction itself causes difficulties because the slope was wrong or the downspout system is missing or badly placed. Just buying some paint for basement moisture ceiling may help a little, but usually the “fix” requires skill and knowledge. Depending on where you live, some repairs may even require a permit and work performed by a licensed, insured professional. Before you pick up the phone for a home inspection, take a few minutes to gather information. The more you can describe to a professional company, the better they can access things even before arriving at your home (including what specialty tools they may need to stop basement moisture problems). Specifically look for puddles on the floor, trickling water in wall cracks, dampness or mold around the base of a concrete brick foundation line, wall condensation, the smell of mildew, rust on metal or decaying wood or blistering of any basement interior paint. Plumbing inspection is a cost-effective way to diagnose basement moisture problems. A plumber will inspect your home inside and out, and run a video camera inspection of your drain pipes to give you an accurate assessment of your basement's state. Exactly what recommendations your contractor gives you depends heavily on the problem. In some cases you might just need to properly pitch your gutters and make sure that downspouts have proper run-offs. Or you might have to adjust window wells, get drain tiles, install a water pump or close up structural cracks. There’s also the option of basement moisture sealing applied to the walls to help keep moisture minimized year round. Whatever the requirements, remember that until you resolve the problem your home continues to take damage and build up further mold and mildew. This is a heath and safety issue for every living thing in your house. Act quickly, get those estimates and find a professional whose work you can trust as soon as possible. Please call us if you are in Toronto or GTA. Why call A to Z Plumbing & Drain? We do plumbing assessments year round, and conduct basement waterproofing - internal and external. Master Prumber Dmitry will come to diagnose your home and prescribe the right remedy for your basement moisture problems. There are many plumbers out there and anyone can inspect your home. However, only the most knowledgeable plumbers with logical mind and right approach to finding solutions can correctly diagnose a complex problem that doesn't give you a clear picture. 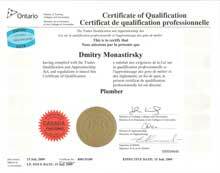 Master Plumber Dmitry worked as a pipe repair engineer in the famous Russian gas giant, GAZPROM. He has a unique experience that you will benefit from at no additional cost.